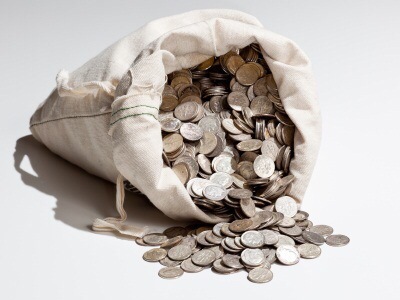 I’ve often wondered what Jesus meant when he told the parable of the three servants that were given bags of silver to hold onto for their master. (Matthew 25:14-30) The end result is clear that the master was pleased with the servants that took the silver, invested it and ended up with more. But he was very unhappy with the servant that buried it to hide it. It seems the obvious implication is that Jesus wants us to invest our money wisely in order to make more. Makes sense, I guess. But is it about money? What about the context of the parable? Jesus tells this story while he’s talking to his disciples about his return one day. About how we must be keeping watch, not being deceived. And how we need to be making sure the other servants are fed. So how do we feed other people? Of course literally, but I don’t think that’s what Jesus means here. I think we feed other people when we contribute to the Kingdom by faithfully using the special gifts and talents God has given us. So if I read this parable and see the bags of silver (interestingly referred to as “talents” in the King James Version) as my God given gifts, it has a whole different meaning. My special skills are not just for my benefit. They should not be hidden away out of sight. I should be setting out every day to invest my special skills, whatever they may be, in the Kingdom of Heaven. I should be using my gifts to glorify my Creator. Whether at work, at home, at church, in my community. Wherever God places me I have work to do for Jesus. If that special skill God gifted me with in some way draws others closer to Jesus, then I am a “profitable servant” for Jesus.